An inspiring November date, the 16th carries a lot of creativity and pleasures in life to those born on it, but has a price tag for all activities that don’t come from the heart. Choices made by these individuals should flow with ease and tough and battling matters might take away their motivation and desire to stay open for beauty and loving relationships. They need a system of supporting bonds kept at a pleasurable distance so they don’t get entangled in disappointment and idealization. 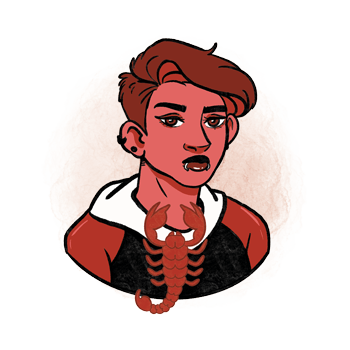 Those born on November 16th have a tale of creativity to tell, and the Water sign of Scorpio always carries a risk of neglect of talents that needs to be broken so they can freely flow. Grounding is of the essence here, and these individuals might have different physical cravings that satisfy their emotional needs rather than simply keeping them fed and giving a roof over their head. They are loving and inspired, in search for support from the right people and relationships, but need a lot of faith in themselves and ways of the Universe to build a healthy bond where both parties are allowed to freely show how they feel and wish to give satisfaction to one another in balance. "After Having Heard an Inspired Individual Deliver his "Sermon on the Mount", Crowds are Returning Home"
This symbol speaks of the sense of faith those born on this date carry within, but points out the importance of the practical world it needs to be incorporated in. Very often, they will separate spiritual from material realities, distancing themselves from living the ideal they wish to achieve in the real world. What seems impossible might just be possible, and outer systems are only there to inspire, not to define, the essence of faith and God in their own world, their own interpretation and their own heart. There is a collective role here to be defined, one that is allowed to stand out in its personal manifestation among those who share the same beliefs and the same clean presence of the unseen. Governed by Neptune as their destination in life, roads may seem a bit hazy for those born on the 16th of November. They have a higher mission to attend to, but this won’t easily be reached by ego and romantic involvements in life until they are certain of their own path. On their quest for the Divine Love and the sensation of constant presence of Nature and their deepest beliefs, they could get lost many times. Still, they seem to hold on to the subtle glow of their inner child with all its talents, carrying the torch in the midst of any crisis they might encounter. 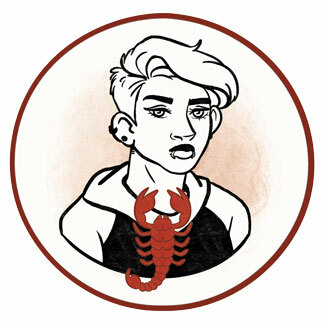 Idealistic and a bit distant from reality, Scorpios born on November 16th will probably be in love for the greatest part of their life. Disappointments could take away their focus if expectations take them too far ahead, and they need to learn to enjoy the moment wherever it takes them, feeling free and untied to those they love. Their Soul seeks higher understanding of all those things that aren’t being said, and this isn’t easily accepted within, let alone in relationships with others who carry their own baggage and limitations. They are to let time do its thing, allowing new bonds to form when old ones became stale and need to be let go of. Ties to the past could be intense, leading them to believe that they will never find happiness again after a tough breakup. On the other hand, their projections into the future keep them away from joyous moments in the present, and this creates an imbalance that their partner might get pushed away by. They need a lot of stability, creative work that will keep them occupied with their own inner world, in order for another person to get to the right position where flaws and challenges are accepted as a part of life by both individuals involved. Someone born on November 16th is artistic and extremely creative, and does well in flexible positions that require quick adapting and creative solutions. They are artists, singers and designers, those who see beauty and inspiration in the simplest of things, and even when their way of expression is a bit dark or unusual, it will make others feel less alone. Their talent is not always one that is easily recognized by close people in their life or the system they belong to, and they need solitude and to get in touch with their emotional strivings to discover what they can truly blossom in. A very good stone for those born on November 16th is kammererite, as it aids their need to create balance in life. It creates harmony and helps one find solutions to problems that preoccupy their mind so they can let go and make room for rest and joyous times when overburdened by daily matters. Highly protective, this crystal assists them in letting emotions flow, getting in touch with angelic beings and the true essence of faith they carry within. To choose a birthday gift for someone born on the 16th of November, artistic and creative works are the best option. They will love presents that smell good, new spices for their kitchen or incent that reminds them of treasures of faith seen through many religions and forms. They are more fragile than they seem, and although dark humor might be a good bet, be careful not to go too far with your choice. Buy a piece of clothing that accents their colors, something light and natural, in balance with the rest of their wardrobe and things you often see them in. Kind, supportive, and ready to relate, they are sensitive individuals who see the inner child in others and recognize talents where they aren’t easy to spot. Talented themselves, they create and find inspiration in small things. Lost, out of balance, they push themselves too far and might expect others to feed them with emotional security that they cannot find within. Jealous or possessive, when rough on themselves, they become envious or simply unmotivated. In 1962 Darwyn Cooke was born, an awarded Canadian comics artist, animator, cartoonist and writer who worked on Catwoman, The Spirit and others. He left his family at 23 to show samples of his work and instantly got his first published comic book work, but the pay was too low to sustain him. He pursued the idea apart from a regular job for the next 15 years before getting published. In 1964 Diana Krall was born, a Canadian jazz singer, pianist and songwriter, who has sold over 15 million albums worldwide. She started studying piano at the age of four and continued pursuing her talent ever since. In 1977 Maggie Gyllenhaal was born, an American actress who starred in Secretary, The Dark Knight and Happy Endings. She didn’t know her own first name on the birth certificate, "Margalite" (Hebrew for "pearl"), until she got married in 2013. 1855 – The first time that a European sees Victoria Falls. 1914 – Opening of the Federal Reserve Bank of the U. S.
1933 – Formal diplomatic relationships are established by the Soviet Union and the United States. 1938 – The first time that LSD is synthesized. 1945 – Founding of UNESCO. 1965 – The first spacecraft that will reach the surface of another planet is launched by the Soviet Union.